Beautiful, breath-taking and magnificent scenery that is surrounded by ancient trees is what you can expect from Grand Manor Gardens. We invite you to have your ideal garden wedding, conference, corporate event or a special occasion at our peaceful and tranquil venue. This venue is situated in the North of Durban, near Ballito. Our venue has backup generators to ensure that your event goes off without a hitch. Grand Manor Gardens is the perfect romantic hide away to host the wedding of your dreams. Positioned in a stunning garden setting, you are able to experience a fairy tale wedding. This venue is perfect for hosting an intimate and elegant wedding. Our venue offers your guest a place to relax and have a cocktail at the poolside while the bridal couple takes advantage of the beautiful scenery around them for a photo shoot. Our prices are affordable to suit your budget. We have a team of professionals will ensure that your day is everything you imagined it to be. Our amazing venue is perfect for hosting a conference. This classic and colonial venue is an ideal environment to get away from the noisy office environment. We have a range of packages that includes meals and refreshments. Grand Manor Gardens is a multi-functional venue which allows us to have special events and functions. The venue can host parties, engagements, cocktail parties and gala dinners. We have a large reception venue and a spacious veranda which leads straight into the beautiful gardens. The team will take the stress out of planning your event so that you can relax and enjoy yourself. We are passionate about what we do. Our aim is to provide you with excellent customer services. Come experience nature’s beauty at its best. 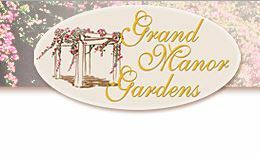 Contact us today to make your reservation at Grand Manor Gardens.